Here's another in a little series of "overdue" posts about my pregnancy and Nell's birth. Nell's birth didn't exactly go the way we had planned. If you've read the birth story, you already know that. In the days, weeks, and even months following her birth, I struggled with that reality: post-partum hormones mingling with weariness and a hundred questions, painfully unanswered and unanswerable. Even as I gazed at the healthy baby in my arms, knew how lucky we were, knew there was nothing to be sad about, I cried every night for a long time, an inner voice nagging: "You should have planned more. Prepared better. Practiced your Bradley techniques more faithfully. Stayed stronger. Stuck with it longer. You failed." The home birth free of medical interventions didn't happen for us. Instead I gave birth in a hospital, with an IV of antibiotics and an epidural. And this was really, really difficult for me to come to terms with. 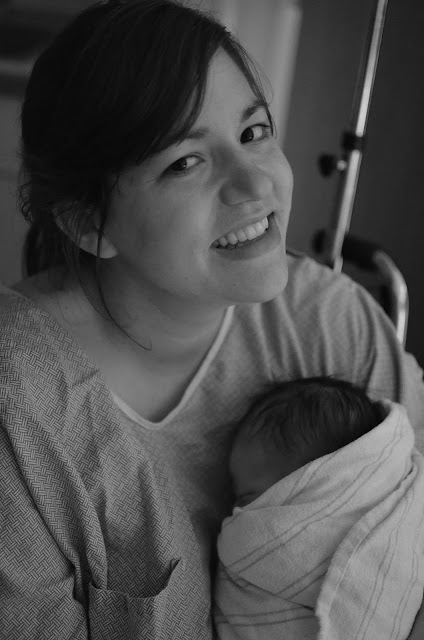 In those days, every friend who gave birth, and every birth story I read, and every blogger who extolled the virtues of intervention-free birth unintentionally rubbed a little more salt into the wounds of my perceived failure. Now, ten months later and my hormones a bit more balanced and my mind a bit clearer, those feelings of failure aren't so overwhelming. Goodness knows that getting an epidural is nowhere close to "failure," and in fact, giving birth - whether with no drugs or with drugs or by c-section - is never "failure." But in those early days after Nell's birth, I was haunted by questions, by "what-if's," and by self-doubt. It seems almost silly now, the tears I shed. I'm sure those few friends I shared my feelings with wondered why I couldn't move past it all. I'm sure poor Nathan had no idea what to do or say, as night after night we tucked into bed and then the tears began -- again. I'm thankful for my friend Story, who was with us for Nell's birth, who patiently listened to my questions through my tears, and worked through the whys and hows of it all, even allowing me to process the unanswerable ones. I'm thankful for my Mom, another good listener who offered encouragement to me during those difficult emotional times. And I'm thankful for my sister Emily (a doula), whose words on the phone reassured me: "We think of birth being only about the baby, but it's really about the mother, too, and your feelings after an experience like this are real and valid." Yes, the end result matters. But what happens to get us there, matters, too, and that's okay. I wanted to know why the baby was persistent posterior, and what I could have done differently, and why the long hours of walking and hands and knees and more walking and more hands and knees didn't help, and why the midwife we had so carefully interviewed and thought we liked ended up being a person we felt we couldn't trust and who didn't help us feel safe or well cared for. Why was it that just while sleeping with an epidural we accomplished in a few hours what laboring naturally for days had not been able to - a baby turned properly face down and ready to be born? Why didn't our midwife explain things to me, talk to me, or seem to do anything more than say bland and generic encouraging things? Why didn't my labor follow a normal progression? With time, I was able to let go of these questions, and the feelings of disappointment in myself faded. These days, I can look at the hospital hat and hospital bracelet in a shadowbox in Nell's room without crying. I can look at the photo of myself getting that epidural without feeling so badly. I think I can honestly say that I'm grateful for not only the way things turned out (we have a healthy baby, and I am alive and healthy), but also for the way things happened. I'm grateful for the process. You see, I think I'm a more empathetic person. If we had been granted the empowering home birth of our dreams, I think I could have become an overzealous drug-free birth advocate, extolling its virtues without really seeing or understanding the other side of the equation. When I remember those nearly seventy hours of labor, and especially the last day and night, what felt like one long endless night of darkness and weariness and pain, I know that I have been given a personal understanding of women who choose medical pain relief, because I've been there. It's not just the birth experience, but the experience of motherhood has also made me a more empathetic person. When I think about how much I love being a mother, I also think of all the women who long to be mothers and, for one reason or another, don't have babies in their arms. When I remember how hard that first four weeks of nursing was - oh, the fist-pounding pain! - it reminds me to never, never judge the mother that just found it too difficult and made the decision to use formula. When I leave my baby in the arms of a babysitter to go to a gig, I know firsthand how agonizing the decisions about work and family can be, and I empathize with other women making those decisions, and find myself less likely to judge those whose decisions might be different from my own. My baby is growing up awfully fast, but what do you know -- I'm growing, too. In a way, I think we have idolistic/idealist ideas of the birth experience - as if it is the culmination of our identities as women - I know at least one of my friends felt less than a woman/mother because she didn't have a vaginal birth. I'm so glad that God has been near to you throughout the grieving process- that he's given you good friends, grace and perspective. Most of all, I'm so glad you have a happy, healthy Nell in your life. I love this honest post! While my labor and delivery was nowhere near the ordeal you endured, for me it was also not how we had planned. While I managed to subsequently have a pain-medication-free birth, I was still pumped full of other drugs, on an IV and labored entirely at the hospital, the majority of the time was while being tethered to numerous monitors. A far cry from my vision of going into labor naturally when baby was ready, laboring with my husband in the comfort of our home and making the choice ourselves when to finally head to the hospital. I wonder sometimes if due to the drugs and IV they had me on, if that didn't help the situation with Ian nursing. Although they gave him straight to me, he was whisked away after only a couple of minutes...not what I wanted at all. I think your story, along with all those birth stories that never seem to go as we plan, is a true testament to how strong women have to be and just the beginning of such hard decisions that motherhood will undoubtedly bring. I'm glad to you can look back on Nell's birth now without some of the guilt and pain you felt in those first few weeks and months. Thanks for sharing! I don't think I had known that Ian was whisked away from you guys! That must have been so difficult, especially after the emotional stress of your labor not going the way you had pictured or planned it. We felt so fortunate that Nell never left our sight, and only left our arms for a few moments to be weighed quite a bit after she was born. We really had a great experience at the hospital in the delivery room. It definitely showed me the other side of things. Yes, sometimes hospitals are overly intervention-prone, but sometimes not. And sometimes interventions can domino-effect into more and more and end up sending things spiraling downhill, but in my case, that epidural made the difference between "dysfunctional labor" (such a depressing term; made me feel like a failure!) and finally getting things going so Nell could make her grand entrance! Funny how things work out. I realize now that I was one of those moms after my beautiful experience with my first because after the second and things were so much harder, even though it was still at home I too cried for many days and nights about how hard it was and how dark. One thing I've also learned from having the most active and mischievous toddler in the room at any given place is that you just don't know until you know. There are many things about which I said to myself I'd never do when he was a baby and things were simpler. I'm still very much learning to give myself he grace I give other moms for similar choices and to watch how I say things. We moms are so hard on ourselves! I don't know if I'll ever stop asking myself how Wyatt's birth could have been better, but I would never have read your story with anything less than complete agreement and admiration. It's just as brave to say you need help as it is to labor for so long with no sleep and no medication. And if there's one thing I know, no two births are the same! Thanks for this comment, Jenn! It is hard to stop asking yourself the endless questions, isn't it. Even though I know that it largely just. doesn't. matter., and it's in the past, and Nell is healthy and we're all fine, I have struggled with asking why it happened the way it happened, if I should have done X Y or Z differently, why it had to be so hard for me and not for A B or C person, etc. It's nice to hear that no two births are the same. I know it wasn't a nice reality for you, as your second was harder, but I'm not sure I'd ever knowingly sign up for a repeat of my experience! Thank you for sharing. That sounds shallow and flippant, but it is a true delight to me and many others to watch 'the kids' (that's you) grow up in every way. God is working in you toward increasing Christlikeness, and it is wonderful. And your post helps folks like me to become more understanding and empathetic toward the half of humanity we will never really understand. Beautiful, Sarah. I'm glad that you've come to a place to be able to write this. And I think that you're right about being a more empathetic person having had this experience. I feel the same way about my births that didn't go as planned. Amen, sister. I had tons of friends, co-workers, and acquaintances who did the natural birth/water birth thing, and LOVED IT, so I was planning the same. I mean, it's happened for all eternity, right? If they can do it, so can I and and that. Well, no. It doesn't always happen that way, but healthy babies and mamas are #1, so I figure everything turned out okay for us. 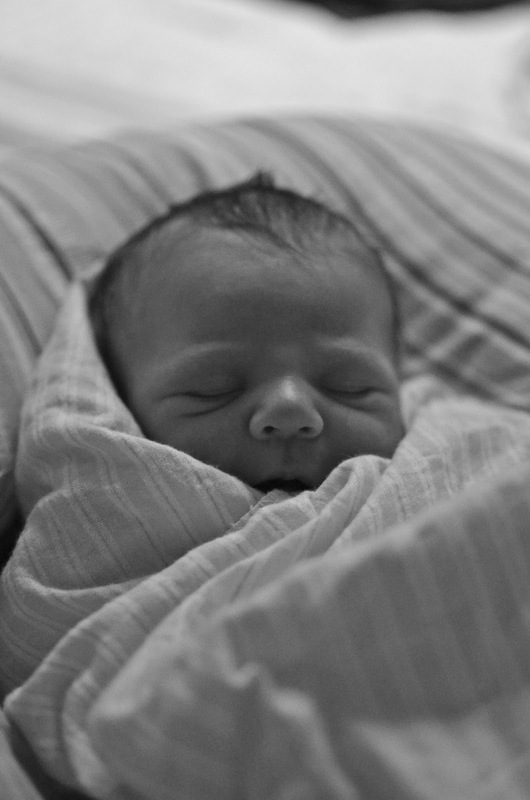 Sarah, thank you so much for sharing such an honest and real birth story. I have had the honor of hearing so many, and you are not the only one who feels this way :-) I have watched some of my closest friends, some of the crunchies and self empowered women I know go through the same thing! Two whoe ended up in C-sections and held onto the emotional trauma for YEARS! Birthing, like parenting and many things in life comes with a lot of preconceived notions, and the reality is most often NOTHING like we thought it would be. For what it is worth I had goose bumps while reading your story, and I think that you will help to comfort many women who feel the same. It is an honor to have gotten to know you, and you are missed in yoga class! P.S. your baby is beyond beautiful!!! So beautiful. And so honest. Thank you for sharing. We had the ideal no intervention birth with our first at the hospital after laboring at home for 5 hours. We were only at the hospital 3 hours before our son arrived! Our second was more complicated, slightly, and we did have a little pit to get things started before our water birth in the hospital. I had to mourn the no-iv birth I'd imagined, and then quickly realize how lucky I was I still could birth low lights in the water. We all have ideas of how we want our children to enter this world, and to mourn the loss of that idea is very valid. I'm glad you had the support you've needed and you're in a better place with your grief. I love this post and admire you for sharing it and Nell's birth story. It takes a LOT of courage, imo, to persevere through such a long and hard labor. I did have a relatively textbook labor that went how I hoped, but pushing was the hardest (and most painful) thing I've ever done and i felt traumatized for weeks over it until I became too traumatized over trying to figure out nursing and get sleep. :) I'm glad I didn't get an epidural only because i don't think i could have pushed her out if I hadn't been feeling everything and finally stopped pushing when the nurse told me to and just done it on my own; but now with a second baby on the way, I'm thinking through all these issues again. It's encouraging to hear how much an epidural helped you relax - maybe it would help prevent the severe tearing I had last time. But I'm scared of getting a baby stuck with her head halfway out. :) I keep reminding myself that one way or the other, she will come out and I will recover! And your story helps reassure me: even if things don't go the way we want, we get beautiful & healthy babies in the end. Thank God for that!